My Husband Miguel loves to eat bananas and has gotten into the habit of sharing a banana with the dogs every time he eats one. So now the mere motion of pulling a banana off the bunch triggers a mad dash of the dog population to the kitchen. You would think he was dispensing fillet Mignon, but no it’s just bananas, but remember I have labs, they are always hungry and anything remotely edible tastes delicious to them. Although upon further thought I don’t think they really taste food, they merely inhale it. 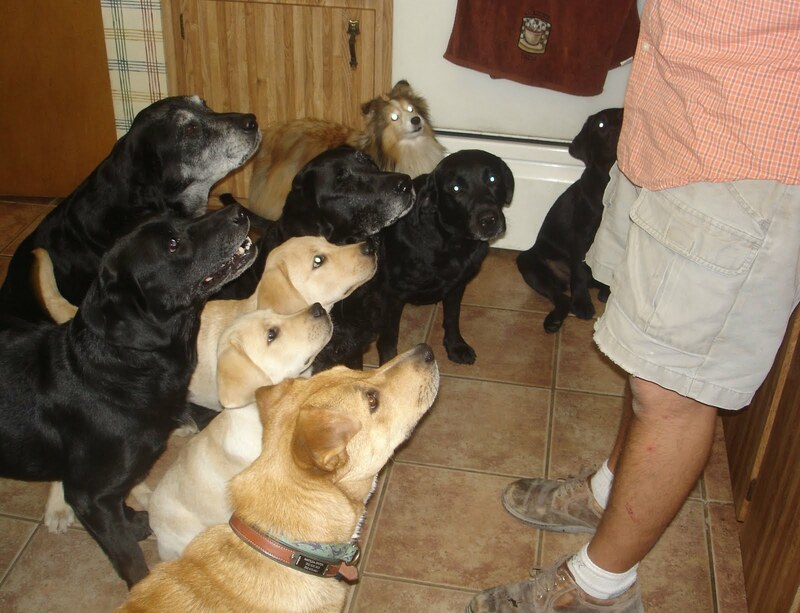 Over the years, the ritual has evolved into the dogs having to sit and wait for their turn to get a piece of banana. Many of you might think this is because we are practicing what we preach: obedient dogs. But it is really a matter of self preservation. Being pounced on by a pack of excited labs demanding their share of the bounty is probably the closest to mutiny on a pirate ship that a human could nowadays experience! So the pieces are handed out by calling each dogs name, in order, starting with the older dog and moving down to the youngest. Until just a few months ago our pack consisted of 5 dogs and the banana ritual was calm and organized; but now with the addition of Tilly and the puppies, Miguel is seriously worried about the integrity of his fingers. A side note on Tilly. When we first offered her a piece of banana she thought we were trying to poison her! She watched the labs eat like we watch those stupid TV shows where they make people eat slimy worms. After a few weeks, she finally accepted a piece and instantly spit it. It disappeared before it hit the ground. So now the labs know, “Tilly is going to spit it!” and as soon as Miguel says her name, all the dogs surround Tilly’s mouth. Talk about peer pressure! So she had no choice but to start chewing AND swallowing the banana with a look in her face like she is going to throw up. Needless to say the puppies were THRILLED to be included in the banana ritual. The older dogs are not so happy. First, the puppies are learning to sit and now they all have to wait longer and second, the banana pieces have shrunk. Now instead of a pirate mutiny we have shark frenzy. Miguel wants to find out where they sell Kevlar gloves!